For a Republic ”founded on work” is completely paradoxical to register the highest unemployment rate within the OECD countries (the most industrialized in the world), Italy is the last within the European country. A paradox that could lead to a modification of the first article of the Constitution written for the newborn Republic. Young people in Italy graduate, not only six years after their European collegues, but also unprepared, obsolete, cut out of the international world of work and with severe difficulties integrating in the Italian job market. ESE affirms the right of young people of dreaming and seeing their dream becoming reality. To go to a job interview, trying to get chosen, waiting in line and looking for anything to do and a boss who pays the wage is underneath a dignity level. Have you ever been to one of those exhibitions, like Chance in Milan, Job&Orienta in Verona or Job Meeting in Padua? Just like a market, young people wander about looking for an employer, a buyer, anyone who would let them do something. At the end, when everything is missing, they hang on Master degree, hoping that a post graduation course will remedy to a lack of preparation that has been going on for years, unfortunately untreatable since too rooted to be corrected. 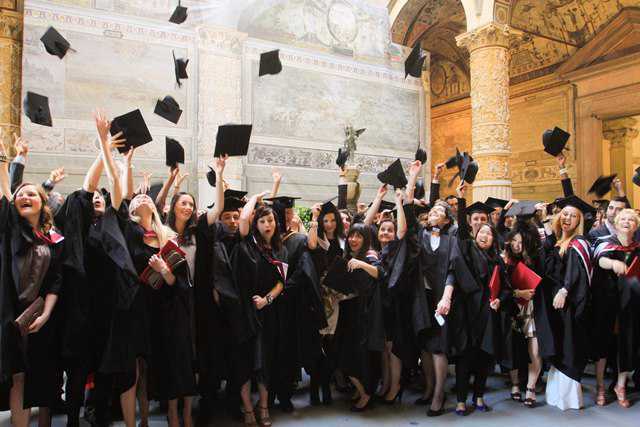 To graduate and then find a job in Italy is harder than in any other European country. The truth is that, while in all the industrial democracies in the world the long age of clerkship is setting, in Italy flutters and is successful the myth of the “permanent job”. We assist with growing apprehension to the increase of unemployment. For years permanent jobs have been decreasing all over the world and the chance to find an employed job, especially for the new generations, seems nearly impossible. Young people are menaced by the fact of not being even able to cross the threshold of the world of work. White-Collar workers are slowly going to be endangered and the age of clerkship, that for two centuries since the Industrial Revolution, had gradually been recognised in the advanced societies, has now reached the turning point. The age of clerkship, in its most modern version, originated about two centuries ago, when time began to be considered a good, when it was believed to be possible buying men’s time instead of what they produce: goods, services and ideas. This happened with the birth of the great companies, and the necessity, following the Industrial Revolution, of having an army of millions of employees, workers or clerks, ready to sell their hard work or their time for a fixed price, a certain amount per hour or month. The employed work is a contemporary phenomenon in the huge proportions that has reached, as a modern version of servile work. Never before as many man had lived a semi-slavery situation with the illusion of being free. The Italian university system, in its stiff organization nearly motionless, tries to live and survive, even if it means dying.Rarely, in history, laws so solemny sanctioned and put as fondament of a whole nation have been so deeply and for a long time disregarded, neglected and betrayed. Young people in Italy graduate, not only six years after their European collegues, but also unprepared, obsolete, cut out of the international world of work and with severe difficulties integrating in the Italian job market. In a borderless job market, where companies consider more and more expertise rather than formal knowledge, the young intellectual unemployment in Italy has only one reason: lack of preparation. We point out, as the responsible of this national disaster, the higher education system, the university education in this country. Where does an economy like the one from Veneto, that exports more than Greece and Portugal put together, look for its managers so to compete with global companies? Where does Diesel, who taught the Americans how to make jeans, look for its directors? Where are the leader of business able to face the challenges in front of them? The job market is asking for young graduate, with international preparation and job experiences, howeer we offer only unprepared outdated young people. Lacking in preparation not only because they don’t have the faintest idea of what is happening in the world of organizations and works, but also and especially because they don’t know who they are. No one helped them feeding and bring up their dream. After years of study without a reason, frightened, they have echanged their passion, the happiness of doing what they love, with the false certainty of a permanent job and look for shelter in an employment or try for years to win a competitive exam, it doesn’t matter where, it doesn’t matter to do what. ESE students graduate in three years and often they integrate in the job market even before recieving the title at the Graduation Ceremony. (three of the most important global companies for sportive footwear). The companies selected five newly graduated students from ESE to attend the Master course for the formaton of their future directors. Also for the most deserving students under a more academic point of view there are big satisfactions. Caterina Cazzola, 21 years old from Verona, has been selected to participate to the 100 day meeting organized by Pittsburgh University and reserved for students from all over the worls. Berkeley University still shows the golden plaques won by ESE students such as Alessandro Nosei. A young person should be able to choose his job. No one has to be put in the situation of accepting any job to survive. To be entitled to that kind of right there’s the need to be prepared. We need schools of freedom, international environments, practical and multicultural approach that, in economy as much as in politics, educates a new generation of business leader, of a young ruling class, of practical dreamers able to harmonise the apparent antagonism that always existed: economy and ethic, action and contemplation, financial power and love.